Perfect for the upcoming Memorial Day weekend, the right colors too. It makes me sad that I forget about pavlovas, they are SO good, SO pretty and SO easy to make. They are just little clouds of goodness and make the perfect ending to any dinner. If you have never had them, they are basically meringues made into a little bowl, that happen to look like a cloud. Perfect for dessert after a big heavy meal. They are so light and airy. Because I hoard berries over the summer and buy them when they are beautiful at Costco, I always have a freezer full waiting to be made into something delicious. This particular sauce I threw together with blackberries, raspberries and strawberries, but you can use any combination to make to your liking. I hope you give this a try, I promise you won’t be disappointed. It doesn’t matter how imperfect your cloud bowls are, the more rustic looking the better. Preheat oven to 250 degrees F. Using a stand mixer (you can use a hand-held mixer but your arm will hurt) beat egg whites with cornstarch on medium speed until the mixture is foamy, about 1-2 minutes. Sprinkle in 3/4 cup sugar, a couple tablespoons at a time while beating the eggs. Beat the whites and sugar mixture until meringue holds stiff, about 15 minutes. Add vanilla and vinegar and beat 30 seconds more. Line a baking sheet with waxed paper. 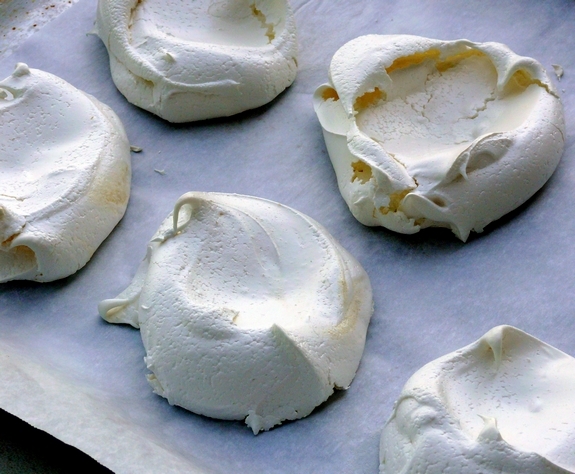 Use a large serving spoon to drop meringue onto paper in 8 equal dollops, about 1-1/2" apart. Press back of spoon into dollops to make shallow bowls about 3" wide. Bake meringues until a pale golden crust has formed (surface should not be sticky), 40 to 50 minutes. Let cool 5 minutes, then transfer to a rack to cool another 10 minutes. 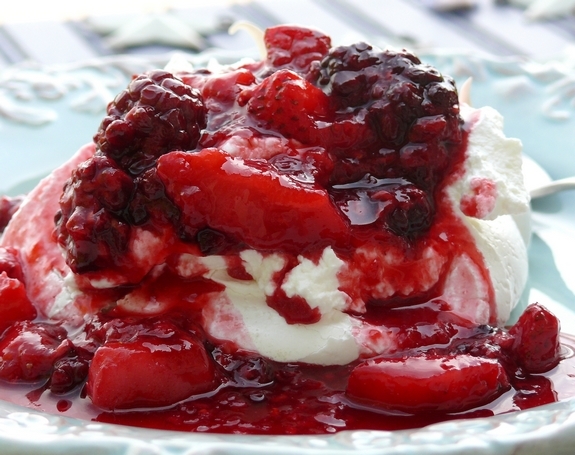 Put berries in saucepan with 1 Tablespoon of sugar. (If your berries are not very sweet you can add more sugar to make them to your liking.) Simmer fruit, stirring gently until berries begin to break down, about 5-10 minutes. Let cool. Whip cream with confectioners' sugar. Top each cooled meringue with whipped cream and then berries, dividing evenly. Make ahead: Pavlovas, up to 1 week airtight at room temperature; sauce, up to 1 day ahead, chilled. This looks so tasty! I absolutely love this idea! This looks amazing, I can’t wait to try making it! Gorgeous! SO perfect to kick off the summer! Thank you Alexis! Can’t wait to see you either! 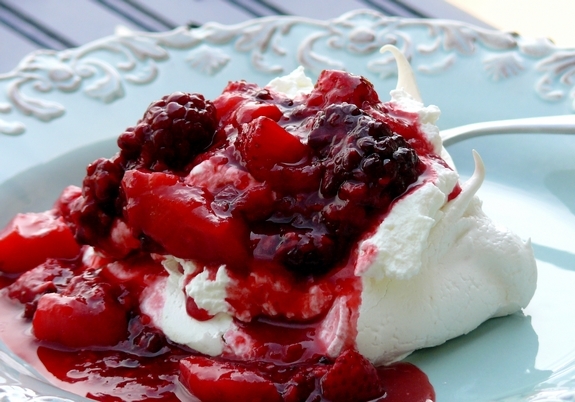 I know, just think of all the berry possibilities or other toppings with these meringues.